Residents are zoned to schools outside of Bordersville in unincorporated areas, including Jones EC/PK School for early childhood education and Pre-Kindergarten, A. W. Jones Elementary School for Pre-Kindergarten through 5th Grade, Townsen Middle School in Humble for grades 6-8, and Nimitz High School and Nimitz Ninth Grade School for grades 9 through 12. Jones Elementary was dedicated on Sunday November 2, 2008. Prior to the opening of Jones, De Santiago EC/PK & Head Start Center and Magrill Elementary School served Bordersville. Parker Intermediate School formerly served Bordersville for grades 5 and 6, and Teague Middle School formerly served Bordersville for grades 7-8. 1 2 3 4 Zuniga, Jo Ann. "Divided Bordersville unified over annexation." Houston Chronicle. Monday September 21, 1998. A13 MetFront. 1 2 Sallee, Rad. "Future arrives at Bordersville/31 years after annexation, poor area gets city's attention." Houston Chronicle. Sunday December 29, 1996. A37. 1 2 "Bordersville Archived May 12, 2008, at the Wayback Machine.. Lone Star College–Kingwood. Retrieved on November 5, 2008. 1 2 3 "Boyer, Teri. Service center offers miracles in Bordersville." Houston Chronicle. Wednesday September 25, 1985. Section 9, Page 1. ↑ "COUNCIL DISTRICT MAPS > DISTRICT B Archived 2008-11-03 at the Wayback Machine.." City of Houston. Accessed October 27, 2008. ↑ "Parks Map Archived 2008-07-23 at the Wayback Machine.." Harris County Precinct 4. Retrieved on November 22, 2008. ↑ "Welcome to Precinct 4 Archived May 9, 2008, at the Wayback Machine.." Harris County Precinct 4. Retrieved on November 22, 2008. 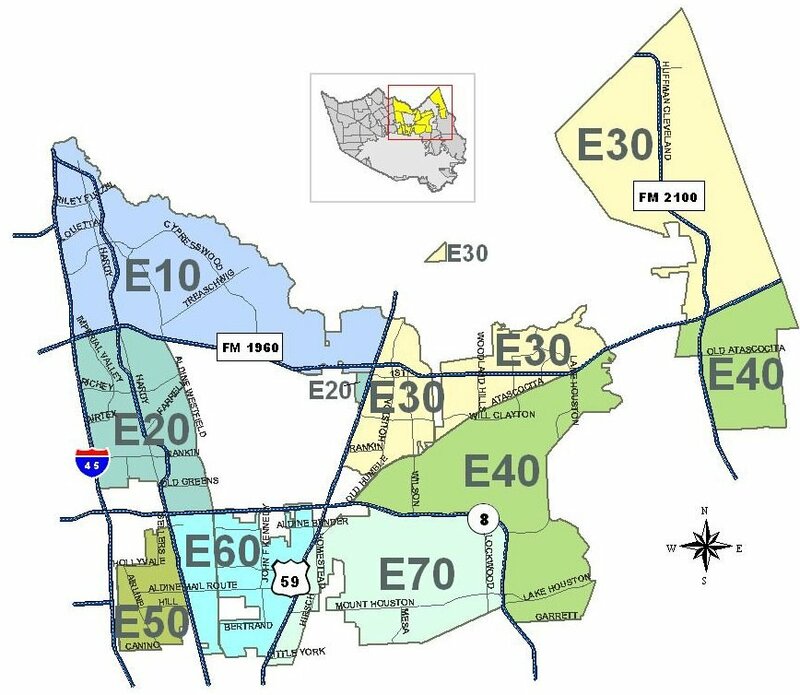 ↑ District II Map Archived February 14, 2012, at the Wayback Machine.. Harris County Sheriff's Office. Retrieved on November 23, 2008. ↑ "District II Patrol Archived June 8, 2008, at the Wayback Machine.." Harris County Sheriff's Office. Retrieved on November 23, 2008. ↑ "Map of Texas House District 141 Archived 2008-08-21 at the Wayback Machine.." Texas Legislature. Retrieved on October 27, 2008. ↑ "Senate District 15 Archived January 7, 2009, at the Wayback Machine." Map. Senate of Texas. Retrieved on October 27, 2008. ↑ "Congressional District 18 Archived 2008-10-02 at the Wayback Machine.." National Atlas of the United States. Retrieved October 27, 2008. 1 2 Texas Education Code, Section 130.191, "North Harris Montgomery Community College System District Service Area". ↑ "ALDINE ISD EC/PK/KG SCHOOLS." Aldine Independent School District. Retrieved on January 27, 2018. ↑ "ALDINE ISD ELEMENTARY SCHOOLS." Aldine Independent School District. Retrieved on January 27, 2018. ↑ "ALDINE ISD MIDDLE SCHOOLS." Aldine Independent School District. Retrieved on January 27, 2018. ↑ "ALDINE ISD HIGH SCHOOLS." Aldine Independent School District. Retrieved on January 27, 2018. ↑ "Elementary Schools Archived 2011-10-02 at the Wayback Machine.." Aldine Independent School District. June 2007. Retrieved on January 20, 2011. ↑ "deSANTIAGO EC/PK." Aldine Independent School District. Accessed October 27, 2008. ↑ "PARKER INTERMEDIATE Archived 2012-03-11 at the Wayback Machine.." Aldine Independent School District. February 6, 2011. ↑ "TEAGUE MIDDLE Archived 2011-10-02 at the Wayback Machine.." Aldine Independent School District. Retrieved on February 6, 2011.